The Internet has changed the way we receive news. There were days when we used to wait for the day to end and read the newspaper to find out what happened yesterday. Then came the TV journalism, but then not everyone has their heads glued to the TV to catch the news all the time. Ever since the Internet has been growing, so has been the way we read and check out the news. It is almost real-time that you get to know about incidents that happen on the other side of the world. Even the mainstream media channels have begun reporting news online before they go live on TV because news could go viral in no time when it comes to the Internet. When there are so many mainstream media websites as well as dedicated niche news websites, do you think you are making a right decision by giving a shot at a news blog? Certainly yes because there are people seeking information from everywhere around the clock, and every source is important for them. In this web world, even the bigger media houses might start following your news blog if you have the right ones to share at the right time. So if you have decided to give it a go and start a News blog, follow this guide that I have written based on experience, and I am sure this is good enough for you to jump start into this. A domain name is the identity of your blog. For a news blog, you should choose a very good and catchy name, for example, instantpolitics.com or quicknewsonline.com or something like that, or a brand-able name such as newspour.com, the choice is totally yours. Just remember that whenever you are trying to mention about your news blog to anyone, that name should be something they are able to remember easily. Selecting and registering a domain name is the first and foremost step after you decided to start a blog, and while you are thinking of a name, you should keep one of the domain sites open to see if the name is available to register or not. You can see a lot of registrars who allow you to register a domain with ease. But wait, if you are having a good budget in the hand and are jumping into blogging with a good idea, you should probably purchase a hosting plan for a year or so, and you will not just be saving a good amount because of the offers available but also will be getting the domain name for free from some of the web hosting providers. There is no difference in the service if you are getting an offer out of it, so take some time to research and then go for the best one. Web hosting is the online service that stores your content on the blog, and when you connect your domain to this server, everyone will be able to access the website. There are different types of web hosting plans, including shared, reseller, VPS, and dedicated servers, and for a new blog, you could go with the smaller plans for now. A good thing with the web hosting services is that you don’t have to register a new plan later and you can just pay a balance to upgrade the current host to a bigger plan when you have a higher traffic and bigger blog in the near future. Some of the good web hosting services to choose from include Hostgator, BlueHost, Asmallorange, etc. For even a small plan, you will see them giving a domain name for free when you choose it for a year at once and pay at a time. You might be wondering, I’m done with purchasing both, what next? You are given a couple of name servers by your host, which has to be entered in the Nameservers section in the domain settings. It could take 24 hours for the DNS to propagate and then the website to become accessible to anyone. WordPress is the platform I would always recommend for any kind of blog because it is the best out there and it offers so much that one would be able to make a site out of the software without having to use any FTP or any special designing software separately. With some of the web hosting companies, you get the cPanel hosting where the cPanel has services or script installers directly available and just a few taps are enough to install WordPress. But if you don’t have those options, worry not, most of the web hosting companies are generous enough to help with these little things that might still be big for you because you are new to blogging. Contact your host and request them to install WordPress for you. Once you are done with the installation of WordPress, the job is half done, and the other half includes your theme, plugins, and content. I’m sure the last one is what you are good at, but with the themes and plugins, I’m here to help. For a news blog, you need to give it a look like a Magazine or a Newspaper, or it would just look like a personal blog. 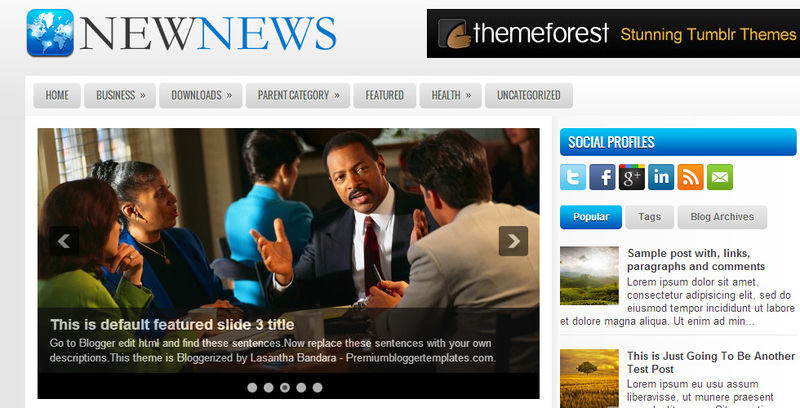 Here are some of the best WordPress themes for News blogs. A proper theme that isn’t only for news, but also for reviews, magazine publishing, and it has support for YouTube videos embedding and a rating system that helps in reviews if you do any. For news, there are good sharing options as well, and the home page has a magazine look. Herald comes with options for long magazine panels on the home page above the standard content. There are lovely animations that make the featured image bigger on hovering the mouse and one can set colors for categories, which makes it even more professional and good it looks. This theme is similar to Herald but even more complex and once you are into it, you can see a great possibility with the way you can customize the look of it. Flex Mag comes with a custom Fly-Out Navigation, custom scoreboard, auto-load posts, and a lot of other options along with it. Top News is a beautiful magazine theme that can help make a news blog of any niche or a general one. It offers the readers or users with social sharing options for every news piece seen on the home page. It is a wide one and on the single news page, you will be able to set up the author section properly so one knows whose articles they are reading. This theme has got options for General news, Technology news, Lifestyle & Magazine news, and Fashion news. It is a very well organized one but you will have to get used to the options given in it, because as good as the theme looks, you will have to work on it so much to take full advantage of it. Although themes do a lot, you will need to have a few plugins and I love whichever I am sharing here because they take the blogging experience to a better level. For a news blog, you should have a cache plugin such as WP Super Cache or WP Rocket, and also work on SEO for traffic from search engine, so a plugin like Yoast SEO would be of a good help. Other good plugins include Related Posts from Category, and YARPP (Yet another related posts plugin). There are hundreds of good plugins out there that serve one or the other function but still, you might want to have only a few because more the plugins, more is the load on the blog. Follow and credit sources: For news blogs, it is not easy to get everything from your internal sources. There are larger publications that might be reporting news at the earliest and if you are writing by looking at their websites, it is very much recommended to credit them because it not just keeps your readers trust you, but also if there is some false information, the blame shouldn’t be on you. Be on time: This is a news blog that you are thinking to run, and if you work as a regular blogger who defines his own time for writing posts, the news is not a right niche for you. For a news blog, you should be super quick in writing news and be sharing them on the social media from where you can get the traffic. Give an author byline: I won’t be able to suggest whether you should have multiple authors or can alone manage it, but usually, for a news blog, there have to be a few people writing content around the clock. If you are doing that, as a good news blog, you should give a proper author byline to your writers. Do not create controversies: Each of us knows that creating controversies and topics that ignite conversations are the one that gets traffic easily, but in the long run, they spoil the reputation of the blog. When you are entering a news niche, you know that this has to be running for a long time, so be ethical and good with the content. Being quick is good, being informative is better: This is where curation comes at help. If you are quick and one of the first to put out a news, well and good, you will get a good traffic. But for a perfect news blog, the amount of content and information you are able to get from different sources is much more important. I hope these are enough for you to gain the confidence and tips you needed to start a news blog and help the world get proper and quick news from your blog. Good luck blogging!